My being a student of Al Azhar makes me a proud muslim. It's a blessing. Al-Azhar University (Arabic: al-Azhar al-Shareef, "the Noble Azhar"), is a premier Egyptian institution of higher learning, world-renowned for its position as a center of Islamic scholarship and education. It is the second oldest operating university in the world. It was built by the Shi'a Fatimid Dynasty (909-1171) who established Cairo as their capital. It is connected to Al-Azhar mosque in Old Cairo, Al-Azhar ( in Arabic: the most flourished and shining) was so called either because it was surrounded by great glittering places, or as a hopeful disposition, or after the name of Sayeda Fatima Al-Zahra', daughter of the Prophet Mohammed. The mosque was built in two years from 969 AD, the year in which its foundation was laid. The school of theology (Madrasah) connected with it was founded in 988 AD. Studies began in Al-Azhar in Ramadan by October 975 AD, when Chief Justice Abul Hasan Ali ibn Al-No'man started teaching the book "Al-Ikhtisar", on the Shiite Jurisprudence. It became a Sunni school towards the end of the Middle Ages, an orientation it retains to this day. 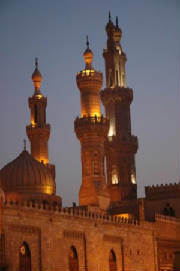 Al-Azhar is considered by most Sunni Muslims to be the most prestigious school of Islamic learning, and its scholars are seen as some of the most reputable scholars in the Muslim world. Among its stated objectives is the propagation of Islamic religion and culture and the Arabic language (the language of the Qur'an.) To that end, it maintains a committee of ulema (Islamic scholars) to judge on individual Islamic questions, a printing establishment for printing the Qur'an, and training (government-appointed) preachers in Islamic missionary work. Al-Azhar is run by a Supreme Council forming general policy, headed by a Grand Imam, known as "Sheikh Al-Azhar." Unlike most universities, it does not admit students who are not practicing Islam, thus it combines the institutions of a Western theological seminary, with those of the faculties established in 1961. In 1961, Al-Azhar was reorganized by the Nasser Government and several secular faculties were added to the university, such as medicine, engineering, agriculture, as well as an Islamic women's faculty. Al-Azhar library, which was consolidated in 1897, is considered second in range, variety and importance only to the Egyptian National Library and Archives in Cairo. It comprises 99,062 books consisting of 595,668 volumes of the most precious Islamic manuscripts and rare books, some as old as the 8th century. The library is a center of attraction to researchers, students and other Islamic universities. It contributes to human knowledge about the Islamic heritage by making photocopies of some of the manuscripts available for the benefit of researchers from Egypt and other countries. The library does not collect non-Islamic literature. Since 1929, Al-Azhar has published a magazine (now monthly) whose stated purpose is to promulgate religious rules, subjects related to Islamic literature, and basic jurisprudence (shariah), including sections on history, biographies, translated texts and news concerning the Muslim world. In 1955, Zaib-un-Nissa Hamidullah became the first woman to speak at the university. In 2005, the Al Azhar online document archive was launched. This is a joint venture between the university and the HH Sheikh Mohammed Bin Rashid Al Maktoum IT Education Project (ITEP) in Dubai. The archive will eventually give access to all 42,000 manuscripts (c. 7 million pages) in Al Azhar library. As of writing, there are around 1.5 million pages available to view. Saad Zaghlul leader of 1919 revolution in Egypt . Nik Aziz Nik Mat, Menteri Besar of the Islamic state of Kelantan in Malaysia.